Delete their profiles and make them re-register "to better serve" them. 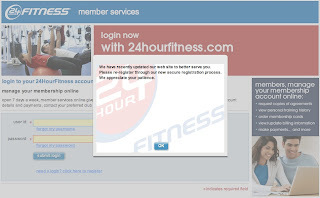 24 Hour Fitness, you have GOT to be kidding me. I know people that have been tracking their weight and blood pressure for years on your site. And this, THIS is what you deliver to your paying customers in the name of progress? You appreciate my patience? You give me too much credit. 24 Hour Fitness, c'mon. I understand that you're trying to roll out a new set of capabilities on the website, but I gotta tell ya, at this point I have no belief whatsoever that you can roll out anything that I'll be able to use with confidence--or whose data won't be orphaned again at some point in the future. This should be Enterprise Architecture 101 meets Customer Relationship Management 101. Migrate the back-end stuff to the new architecture, making customers happier with new functionality integrated with existing data. You already have a data store of people's information mapped to their login ID. Carry it forward to the new system. Maybe the new system is based on a different, more scalable architecture. Maybe the new system can't import the (hopefully encrypted/hashed) passwords. But, is it really that tough to move the existing data store into the new database model? Databases rarely get simpler, so I doubt that you've gotten rid of the basics like login name, password, and member number. Well, since you need them in the new system, why not carry 'em over from the old system? I'll need to create a new password, you say? That's fine--let me click a button to generate a one-time password reset link, sent to my e-mail address on file. Or, let me punch in the membership number on my card to validate my identity, allowing me to create a new password in the new database. But, to just totally whack everybody's account and user data is inexcusable. Instead of EA 101 meets CRM 101 to deliver a seamlessly elegant solution via an elegantly seamless migration, you've ended up with a train wreck. I guess that's what happens when a company without a CIO tries to roll out a project like this. But, c'mon--one of the CXOs listed on this page had to sign off on this thing. Whether you're the big dog, the marketing guy, or the finance guy, somebody had to know about the fact you were orphaning your user data. And if you didn't, y'all need to start asking some hard questions of the rest of your team. Pronto.